Want to Go to Mars? Join Us for the Next Best Thing! Want to go Mars? That might take a while. For the next best thing, join us when Dr. Geoffrey Landis presents a tour of the red planet. Jeff’s tour features NASA photos from the Martian surface and his explanations of what we we’re seeing. 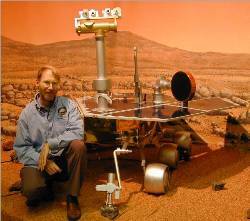 Dr. Landis is a specialist in space power and propulsion at the NASA Glenn Research Center in Cleveland, OH, working on the Mars Exploration Rovers Team that produced both the "Spirit" and "Opportunity" rovers. He is currently the McNair-NASA Visiting Professor at MIT. Jeff is also a Hugo and Nebula award-winning writer of Science Fiction. His first novel "Mars Crossing" won the Locus Award for best first novel. You can check out his Science Fiction Website. And according to reviewer Gregory Benfod he is "one of the best hard science-fiction writers ever. He really knows his stuff." Dr. Landis is shown in the photo with the Mars Rover "Spirit." For this meeting we will be joined by the Explorers Club, our occasional partners for adventuresome meetings. I-95 South to Exit 12B -- Phila. Airport, marked "Lester/Cargo City"